Born in Pitheavles, near Perth, Scotland, in 1720; died in Newport, R. I., April 2, 1805 (?). After an excellent education he studied medicine and became a physician, and during the Rebellion in Scotland had occasion to exercise his profession at the battlefield of Culloden, April 16, 1746. Having soon afterward emigrated to South Carolina, he was on the 8th of June, 1747, appointed Surgeon to the "Three Independent Companies" of H. R. M. regular foot, then stationed in that province. On the 22nd of January, 1755, he resigned his commission and settled in the Parish of St. George, Dorchester, S. C., and engaged in the practice of medicine. January 11, 1775 to November 1, 1775—Member of Provincial General Assembly of South Carolina. November 16, 1775-—Appointed member of the Council of Safety. March 26, 1776—Chosen a member of the Legislative Council of the Province. November 9, 1780, when exchanged. March 15, 1781—At battle of Guilford Court House, Va.
April 25, 1781—At battle of Hobkirk’s Hill. May 7, 1781—Appointed by Congress Director of American Hospitals to the Army commanded by Major-General Nathaniel Greene. May 15, 1781—Deputy Director Hospital Department for the Southern Army. May 21 to June 19, 1781——At siege of Fort Ninety-six. September 8, 1781—At battle of Eutaw Springs. Subsequently in camp on the High Hills of Santee. July 13, 1783—Southern Staff Service having been discontinued, placed on "Waiting Orders." After the peace again became the representative from his old parish, St. George, Dorchester, in the South Carolina General Assembly, until he removed to Newport, R. I., in 1785. Here on the 23rd of October, 1785, he was married to ANN, daughter of SAMUEL VERNON, Esq., Merchant of Newport, and granddaughter of Governor RICHARD WARD, of Rhode Island, and on the 20th of November sailed for Charleston, S. C., with his wife. On the 14th of June, 1786, he returned from South Carolina in the sloop Mary and thenceforward made his home in Newport, where he practised medicine until his decease. He was an original member of the South Carolina State Society of the Cincinnati, and a member of its Standing Committee from October 6, 1783, and joined the Rhode Island Society by transfer July 4, 1788. The Honourable DAVID OLYPHANT left one son, DAVID WASHINGTON CINCINNATUS OLYPHANT, who was born in Newport, R. I., March 7, 1789. NOTE: The Military record of Doctor David Olyphant is from the records of the Rhode Island State Society of the Cincinnati, compiled by Col. Asa Bird Gardiner, LL.D., Secretary-General, and President of the R. I. State Society, of the Cincinnati. THE rare privilege of rounding out four score years and ten and of watching the wonderful progress that has been made during this period—the development of great railroad systems, the application of electricity to countless industrial activities, the navigation of the air and under water, the finding of the North and South Poles, and many other great discoveries that have made this era the most notable in the history of the world—is granted to only a chosen few. One of these, Mr. Robert Morrison Olyphant, was born in New York City, September 9, 1824, the youngest son of David W. C. Olyphant and Ann Archer (McKenzie) Olyphant. His father was a prominent New York merchant, the son of Dr. David Olyphant, who espoused the cause of Prince Charles Edward Stewart, and came to Charleston, S. C., soon after the battle of Culloden. He was appointed Director-General of Hospitals, Southern Department, in 1776, and held the offlce throughout the Revolutionary War. Mr. Olyphant was named for Robert Morrison, the first British missionary to China, and an intimate and life-long friend of his father, who gave free passage in his ships to Dr. Morrison, after the latter had been refused by the East India Company. Mr. Olyphant also gave free passage in his ships to all of the early American missionaries to China, and interested himself deeply in their welfare. One of these ships was named the Morrison, as a tribute of this friendship. 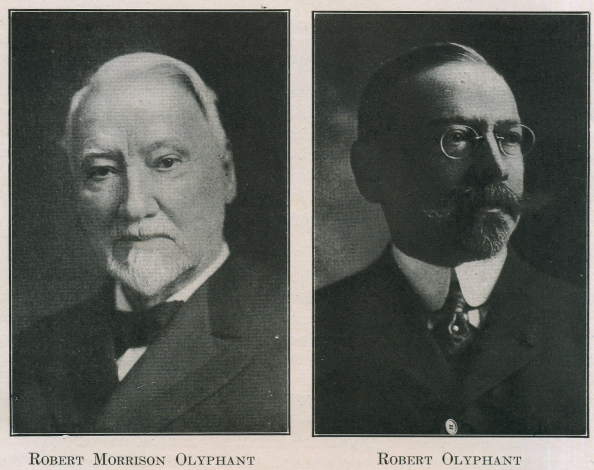 Robert Morrison Olyphant’s education began at the age of three in Troy, N. Y., and later he attended the schools of Isaac Webb, Middletown, Conn., and Daniel Bacon, New York City. He entered Columbia University at the age of fifteen, in the class of 1843, but by diligent work was able to complete his course in three years, and to be graduated with the class of 1842. He is the oldest living alumnus of Columbia. After graduation he entered the employ of Talbot, Olyphant & Company, an East India trading firm, of which his father was senior member. He visited China in 1844, returning a year later. In 1846, he married Sophia Vernon, of Newport, R. I., great-granddaughter of Gov. Richard Ward of that state, and after her death, in 1855, he married her youngest sister, Anna Vernon. Of ten children, Robert and Mrs. George Casper Kellogg are now living, also eleven grandchildren and two great-grandchildren. A son, John Kensett Olyphant, died June 22, 1916. In 1858, Mr. Olyphant re-organized the old firm of Olyphant & Company, of China, and again visited the Orient, where he remained for four years. He was the active head of the firm until his retirement from mercantile business, in 1873. Here it may be noted that the company firmly declined to have any dealings in opium, and no ship of Olyphant & Co. ever carried a pound of the drug. In May of that year he was elected a member of the Board of Managers of the Delaware & Hudson Company, and afterward served as Assistant President, Vice-President, and for twenty years as President, and in his advanced years holds the honorary position of Chairman of the Executive Committee. His relationship with his associate officers and the employees of the company was always cordial and happy. At a meeting of the Board of Managers, upon his retirement in 1903, resolutions were passed expressing the high esteem in which he was held and their confidence in his executive ability. At this time a handsome punch-bowl and salver were presented to him by the officers of the company and the employees of the New York office. The Delaware & Hudson Company is one of the oldest mining companies in the country, and was the first to import and operate a steam locomotive on its railway, in 1829, the oldest company operating steam railroads in the United States. In 1901, the assets of the company were $55,282,239.10, and the net earnings $3,370,706.67. During Mr. Olyphant’s connection with the company (to 1903), $35,000,000 was paid as dividends and $200,000,000 in wages. Mr. Olyphant always has taken a deep interest in the development of American art and other public-spirited enterprises. As a Fellow of the National Academy of Design, he was instrumental in raising the money for its first building in New York City. He has been a member of the St. Andrew’s Society of the State of New York for seventy years, having joined in November, 1846, and is its oldest living member. RESOLVED, that the members of the Society present at this, the 160th Annual Meeting, extend to Mr. Robert Olyphant, who has attained the well deserved age of ninety-two years, and now celebrates to-night his Seventieth Anniversary Annual Meeting, their heartiest congratulations upon his long and honourable association with this Society of Scotsmen and their descendants in the City and State, a record of membership seldom, if ever, surpassed in the annals of the societies of this city, and wish him continued good health, happiness and prosperity during the years to come. It is further RESOLVED that this resolution be spread at large upon the Minutes of the Meeting and that a copy of the same, signed by the President and the Secretary and sealed with the Great Seal of the Society, be transmitted to Mr. Olyphant. Mr. Olyphant has always been connected with the Presbyterian church. Notwithstanding his advanced years, he takes an interest in many of the philanthropies of the church, city and state, and still keeps his interest in the affairs of China as one of the staunch backers of the Canton Christian College. The record of such a life, now nearly rounding out a full century of business activity and service to his fellow men, is the greatest legacy, not only to his family, but to the community and the world. ROBERT OLYPHANT, son of Robert Morrison Olyphant and M. Sophia Vernon, was born in New York City, August 26, 1853. He was educated in private schools and spent a year, 1866-67, studying in Paris. In 1872, he entered the employ of the Union Car Spring Manufacturing Company, of which Frederick W. Rhinelander was President. He remained with this company until February, 1874, when he became a member of the firm of Ward, Talbot & Olyphant, and remained in the coal business under the firm name of Ward & Olyphant until 1910 when he retired. He was always fond of military matters and enlisted in the Seventh Regiment, National Guard of New York, in November, 1871, and on January 1, 1877, he was appointed Aide-de-Camp on the staff of Governor Lucius Robinson. In October, 1879, he was appointed Acting General Inspector of Rifle Practice of the State, and on December 24, General Inspector of Rifle Practice, succeeding George W. Wingate. After Governor Robinson ‘s retirement, Mr. Olyphant returned to the Seventh Regiment and remained there until March, 1880, when he became Inspector of the First Brigade and subsequently for six years Assistant Adjutant General of that Brigade. Governor Cornell breveted him Brigadier-General. Since then he has been on the Reserve list. He has taken active interest in various philanthropic and patriotic societies of the day. He is now President of the United Hospital Fund of New York, formerly the Hospital Saturday and Sunday Association. He is President of the Sons of the Revolution in the State of New York, and was for many years a manager of the Saint Andrew ‘s Society of the State of New York. He is a member of the Society of the War of 1812 and of Foreign Wars, and a director in numerous financial institutions. He is a trustee of the Brick Presbyterian Church and treasurer of numerous of its interests. He is one of the oldest members of the Chamber of Commerce, a member of the Merchants’ Association, and belongs to the following clubs: The Union, Army and Navy, New York Yacht, City, and Bankers. In May, 1880, Mr. Olyphant married Caroline Wetmore Muller, and their children are Amy Gordon Olyphant, who married William de La Roche Anderson in November, 1904; Robert Morrison Olyphant, Jr.; Sophie Vernon Olyphant and Donald Olyphant. Mr. and Mrs. Anderson have two children, Marie de La Roche and Caroline Olyphant Anderson. Mrs. Robert Olyphant died, April, 1910; in August, 1912, Mr. Olyphant married Marie Viele Olyphant.